Behind the girl rides her army of ten thousand warriors, all of them united by the same strange and feverish joy as they crash across the winter fields, through the white land and toward the shadowed stillness of the pines. She is seventeen, a peasant, unschooled, simple as a thumb. But on this morning, she is simply God's arrow, shot across the winterland, brilliant and savage and divine. Unstoppable. It is the fifteenth century, and the tumultuous Hundred Years' War rages on. France is under siege, English soldiers tear through the countryside destroying all who cross their paths, and Charles VII, the uncrowned king, has neither the strength nor the will to rally his army. And in the quiet of her parents' garden in Domrémy, a peasant girl sees a spangle of light and hears a powerful voice speak her name. Jehanne. The story of Jehanne d'Arc, the visionary and saint who believed she had been chosen by God, who led an army and saved her country, has captivated our imaginations for centuries. But the story of Jehanne--the girl--whose sister was murdered by the English, who sought an escape from a violent father and a forced marriage, who taught herself to ride and to fight, and who somehow found the courage and tenacity to persuade first one, then two, then thousands to follow her, is at once thrilling, unexpected, and heartbreaking. 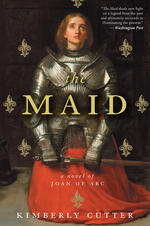 Rich with unspoken love and battlefield valor, The Maid is a novel about the power and uncertainty of faith, and the exhilarating and devastating consequences of fame. I'd like to read this - sounds good. Thanks. I love reading historical fiction! This is a great sounding book about a very important historical figure. I'd love to win it, thanks Freda.